Broadway In Chicago is pleased to announce that single tickets for the upcoming RENT 20th Anniversary Tour engagement in Chicago will go on sale to the general public Wednesday, March 22, 2017. The popular musical will play the Oriental Theatre for a limited one-week engagement from May 9-14, 2017. In 1996, an original rock musical by a little-known composer opened on Broadway and forever changed the landscape of American theatre. Two decades later, Jonathan Larson's RENT continues to speak loudly and defiantly to audiences across generations and all over the world. Now, this Pulitzer Prize and Tony Award®-winning masterpiece returns to the stage in a vibrant 20th anniversary touring production. A re-imagining of Puccini's La Bohme, RENT follows an unforgettable year in the lives of seven artists struggling to follow their dreams without selling out. With its inspiring message of joy and hope in the face of fear, this timeless celebration of friendship and creativity reminds us to measure our lives with the only thing that truly matters, love. The show received its world premiere Off-Broadway at New York Theatre Workshop on February 13, 1996 to ecstatic reviews and transferred to Broadway on April 29, 1996. 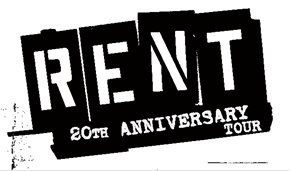 RENT is winner of the 1996 Tony Award® for Best Musical as well as the Pulitzer Prize for Drama. It is one of only five musicals to win both awards. The RENT 20th Anniversary Tour is produced by Work Light Productions, whose other touring productions include Cinderella, MAMMA MIA!, Irving Berlin's White Christmas, Vocalosity, and Crazy For You. Broadway In Chicago was created in July 2000 and over the past 17 years has grown to be one of the largest commercial touring homes in the country. A Nederlander Presentation, Broadway In Chicago lights up the Chicago Theater District entertaining well up to 1.7 million people annually in five theatres. Broadway In Chicago presents a full range of entertainment, including musicals and plays, on the stages of five of the finest theatres in Chicago's Loop including The PrivateBank Theatre, Oriental Theatre, Cadillac Palace Theatre, and just off the Magnificent Mile, the Broadway Playhouse at Water Tower Place and presenting Broadway shows at The Auditorium Theatre of Roosevelt University.